This statistic shows the most popular YouTube channels, ranked by number of subscribers. As of April 2019, singer Ed Sheeran was ranked tenth with 38.2 million subscribers. Video game commentator PewDiePie was ranked second with almost 94.71 million subscribers. Youtube was launched in 2005, as a platform for sharing user-generated videos, such as video blogging, tutorials or original series. The site grew rapidly and was reportedly receiving 100 million video views per day and had more than 65 thousand daily uploads only a year later. As of 2015, 81 percent of global internet users had visited the online video portal in the last month and 31 percent of YouTube users access it more than once a day. Since its creation, the website has had a tremendous social impact and is credited, among other things, with promoting democracy by giving a voice to minorities and enabling citizens to engage with their governments or communities. Through its Partner Program, YouTube also rewards uploaders of popular videos with a share from the revenues resulted from advertisement on their page. 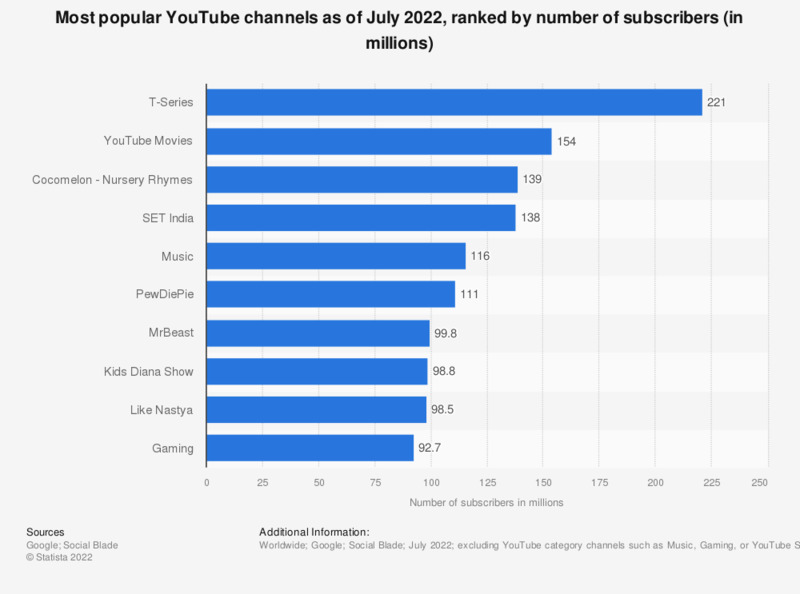 This, paired with the fact that many users of the video sharing platform tend to have favorite channels that they go back to regularly, has given rise to another phenomenon: the rise of YouTube celebrities. Although some of them, such as Justin Bieber, were discovered on the website, but moved on to real life stardom, many others have maintained YouTube as their primary platform of delivering content and staying in contact with fans. As of January 2019, three of the top 20 most popular YouTube channels by number of subscribers are YouTube celebrities: PewDiePie, HolaSoyGerman, and Smosh. Due to the high number of subscribers and even higher number of views, these out-of-the-box stars not only have millions of fans, but also considerable earnings from their Youtube activities. Felix Arvid Ulf Kjellberg, better known as PewDiePie to his almost 83 million subscribers (called “bros”, all part of the "Bro Army"), is the most famous YouTube gamer. Since 2013, his channel has amassed the most YouTube subscribers and in 2018, his estimated annual earnings were almost 16 million U.S. dollars. Women: How important are auto-play videos for a website that shows online visual content? Women: How do you feel about webpages where content is shown mainly through videos? Women: Do you seek out viral videos online when you want to learn or achieve something in parenting?